Phillips is a master of noir imagery. Ed Brubaker and Sean Phillips slowly reveal what is behind the curtain in “Fatale: Death Chases Me”, but they only let readers in on enough before too much is exposed. No, there’s plenty of time to uncover the mysteries that lie in virtually every corner of “Death Chases Me”, the first volume of Brubaker and Phillips’s compelling series. While there is ample story within this small volume, revealing too much of the plot would spoil the gruesome fun of this occult-noir-mystery. Though “Death Chases Me” opens in present day San Francisco, Brubaker and Phillips set the bulk of the story in 1956. Nicolas Lash is attending the funeral of his godfather, Dominic “Hank” Raines, when he meets a mysterious woman named Josephine with whom Nicolas is immediately smitten. Later that night, Nicolas comes across an unpublished manuscript of Hank’s while rummaging through the home of the deceased man. It is here where everything in Nicolas’s life is turned on its head. Of course Josephine figures into things as Nicolas begins to uncover that Hank was similarly drawn into the middle of an unimaginable mess involving the occult. Soon we’re in the past, following Hank as he gets caught up in a torrid affair with the longtime girlfriend of a crooked cop named Walter Booker. Hank is a reporter who has come across evidence that Walter and his partner are on the payroll of a local mob boss. Walter, who is already suffering from cancer, seeks out the aid of the devious Mr. Bishop, a man with vile methods of helping those who seek out his assistance. 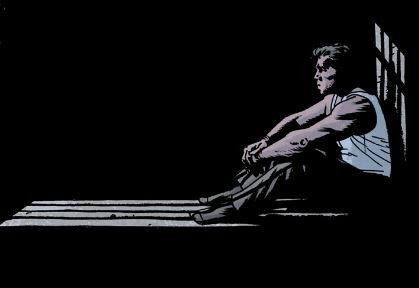 Brubaker keeps his story moving, dropping pebble-sized hints of what mysteries are being developed as we get caught up in Hank’s plight. What is Josephine looking for and what will happen if she doesn’t find it? What power does she have over men and exactly how much is she able to control it? What is in Hank’s perplexing manuscript and how much of it is based on fact? “Death Chases Me” is worth a second read to catch some of the clues left by Brubaker along the way. By the close of the first volume, though many of the answers are fairly ambiguous, there is nothing unsatisfying about the book. Phillips, one of the medium’s best storytellers, always astounds; the artist moves his camera sensibly, consistently capturing the perfect shot to clearly depict the action. Phillips’s characters are expressive and have all the attributes necessary to impeccably fit into Brubaker’s dark noir tale. Add to this a flair for gore. “Death Chases Me” calls out to my affinity for blood-dripping carnage. There are beheadings, disembowelments, and brains blown colorfully from skulls; “Death Chases Me” drips as much with blood as it does mystery. The colors by Dave Stewart are as dramatic and gorgeous as we have come to expect from the multi-Eisner award-winning colorist. His palette is filled with muted tones, and he adds depth to the art with the use of subtle textures. However neutral some of the scenes may be, once the butchery begins, the deepest or deep reds is utilized to highlight the bloodshed. “Fatale: Death Chases Me” drops its characters right into the middle of the action from the beginning and the story doesn’t stop moving. It’s an absorbing mystery that never divulges too much, which is ultimately what compels you to continue turning its pages. Should Sony Really Adapt “The Night Gwen Stacy Died”?